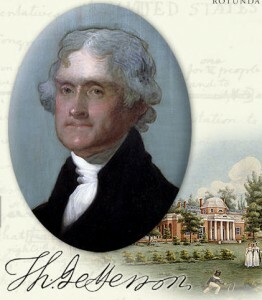 Falvey recently acquired the digital edition of the Papers of Thomas Jefferson from the University of Virginia Press. The Jefferson papers are part of the American Founding Era Collection, which includes the papers of other major figures of the early republic such as John Adams and George Washington. The digital collection encompasses volumes 1-33 (1760-1801) of the projected 60-volume print edition published by Princeton University Press. The Library has volumes 1-35 of the print edition. Volume 36 is forthcoming in February 2010. The digital edition of the Papers of Thomas Jefferson includes the copious correspondence written and received by Jefferson as well as his private notes and documents of historical significance in a fully searchable online environment. Volumes 1-4 of the retirement series are slated to be added to the digital collection in the near future. The electronic version of Jefferson’s papers presents unique opportunities to Villanova University faculty and students. With a few keyboard strokes interested scholars can find all letters from Jefferson to or from any of his many correspondents. 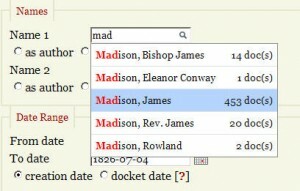 A unique lookup feature for letter authors and recipients (see image below) makes it possible to limit search results to a unique person, inconsistent spelling notwithstanding. Letters that are dispersed over 35 print volumes are brought together on the screen. The full text search feature will find all instances of any word or name in a matter of seconds. Different forms of nouns and verbs are matched through stemming. For instance, fight will be matched to fights, fought, and fighting. Word stemming is also supported for French, since a significant part of Jefferson’s correspondence is in French language: a search for œil or oeil will retrieve documents with the plural form yeux. Other search features are wildcards, phrase searching, automatic “and” queries, and exact form matches. Click here for detailed search instructions. The correspondence can also be browsed in chronological order or by print volume. Letters can be saved as jpeg files by clicking on the small icon next to the page number at the top of each page. Unfortunately, it is not possible to save search results to a folder or email them. Each document includes a reference to the print volume, a canonical URL and a recommended citation. Please note that the canonical URL lacks Villanova ldap authentication and will hence only work on campus. Please contact me if you need authenticated URLs to individual documents for your students. At the current time Villanova University has only access to the full text of the Jefferson papers in the American Founding Era collection even though you will be able to see and search the other collections. Links to the digital collection can be found in the Library’s catalog, on the Databases A-Z list and on the history subject guide under the primary sources tab.